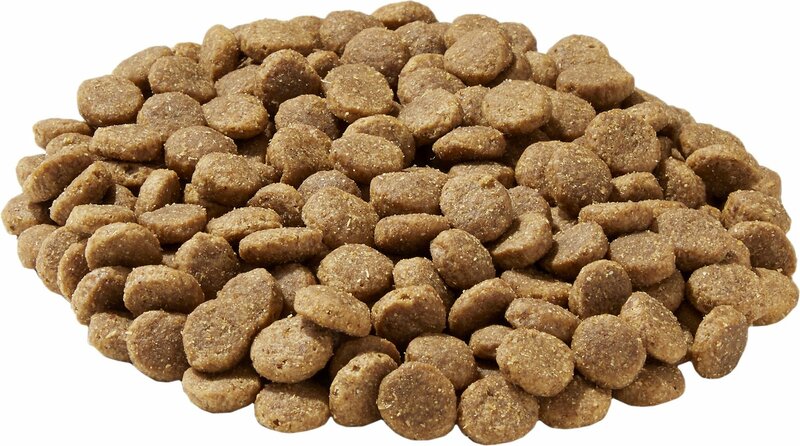 For dogs with food sensitivities and specific dietary needs, Go! Sensitivity + Shine recipes are a great option! 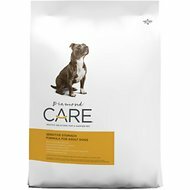 They're great for all dogs, but were formulated especially for the more sensitive ones. This Duck Recipe is carefully prepared with premium-quality duck, unique carbs and omega oils. Duck Meal, Oatmeal, Potatoes, Whole Oats, De-Boned Duck, Canola Oil (Preserved with Mixed Tocopherols), Apples, Natural Flavor, Flaxseed, Quinoa, Calcium Carbonate, Potassium Chloride, Sodium Chloride, Dried Kelp, Vitamins (Vitamin A Supplement, Vitamin D3 Supplement, Vitamin E Supplement, Inositol, Niacin, L-Ascorbyl-2-Polyphosphate (a Source of Vitamin C), D-Calcium Pantothenate, Thiamine Mononitrate, Beta-Carotene, Riboflavin, Pyridoxine Hydrochloride, Folic Acid, Biotin, Vitamin B12 Supplement), Minerals (Zinc Methionine Complex, Zinc Proteinate, Iron Proteinate, Copper Proteinate, Zinc Oxide, Manganese Proteinate, Copper Sulphate, Ferrous Sulphate, Calcium Iodate, Manganous Oxide, Selenium Yeast), Dried Chicory Root, L-Lysine, Dried Lactobacillus Acidophilus Fermentation Product, Dried Enterococcus Faecium Fermentation Product, Dried Aspergillus Niger Fermentation Product, Dried Aspergillus Oryzae Fermentation Product, Yucca Schidigera Extract, Dried Rosemary. We suggest feeding twice a day, puppies more often. Provide fresh, clean water at all times. Regular exercise will help maintain a healthy body weight. Love, attention and tummy rubs should be given freely, as often as possible. 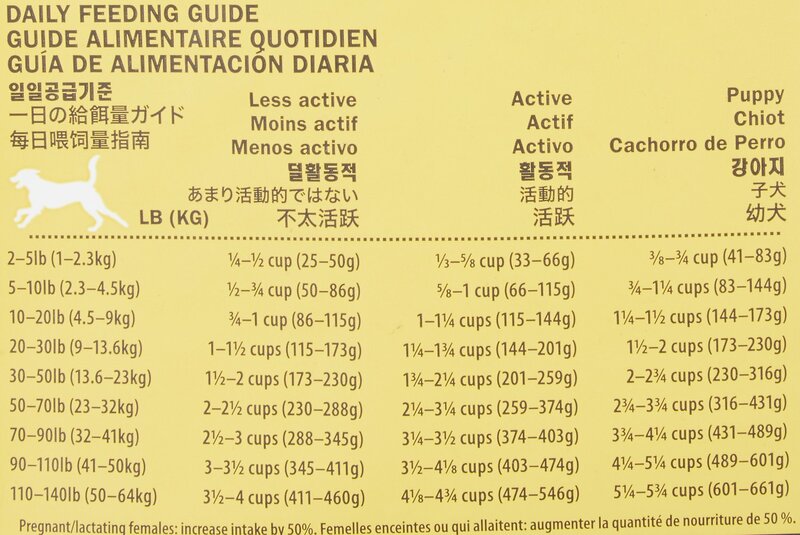 Pregnant/lactating females: increase intake by 50%. I transferred to Canada for a while and the well known brand we had been using appeared to change she was having multiple bowel movements much more than in the past. The local pet store recommended Go we tried it and no more issues. When we moved home I picked up several bags to bring back while we looked for a new dog food. I was very pleased when we found Chewy and they carried Go Duck. We’ve been using Chewy and Go Duck since. My dog developed stomach issues with another brand she had been eating since she left the breeder. the other food was what the breeder recommended. I was advised to get Go! Sensitivity and Shine Duck Recipe and we have had no problems and it seems the stomach issue has been resolved. We have a mastiff and she loves this food. Will continue to buy! 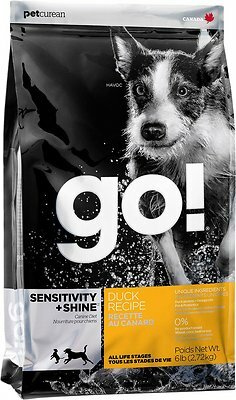 I had bought duck formula from a local store many times before for my dog with severe allergies to just about any form of carb besides legume. 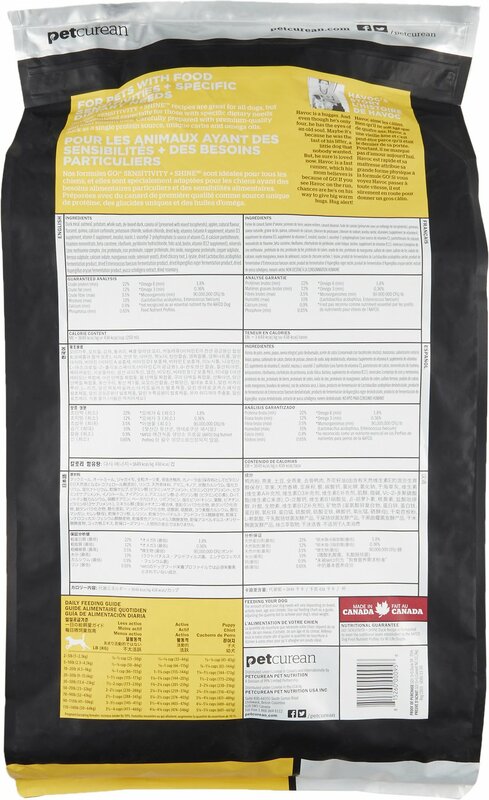 Imagine my shock and disappointment when my order from chewy of "duck formula" shows up with potato and oatmeal other carbs that my poor girl absolutely cannot have. I have no idea why the formulas are different but needless to say i will not be ordering through chewy again. The food is $3 cheaper locally anyway. I live Go but my dog did not. I will try a different flavor next time. She is a Fromm lover and is bummed it's gone from chewy! But I think she willlike the chicken better! My dogs love the taste and it helps with sensitive skin. We have a yellow lab whose body temperature runs hotter than most dogs. She pants heavily during the warmer seasons, even when she is at rest, throughout the night, etc. I found that there are cooling foods out there (duck) that will help this problem. I love this food, it stopped her from panting heavily and she seems so much more comfortable in general. Thank you too for the quick delivery. HIGHLY recommend to anyone with a dog that has the problem our Ivy does. The only bad part is the price, wish it wasn't so expensive.